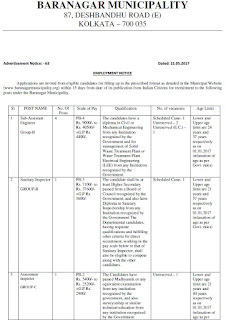 Baranagar Municipality Recruitment 2017 Apply for 175 Mazdoor & other Posts - Baranagar Municipality had issued advertisement notice no. 63 for 105 Mazdoor and 70 Driver SAE Inspector & other posts. Eligible candidates can apply up to 02 June 2017. A4 size paper.(www.baranagarmunicipality.org). Applications should be sent either by ordinary post or submit directly in the “Drop Box” to be kept in the Municipal Office during office hour on working days. No application will be received by Registered post/courier services. The application should reach office on or before 02.06.2017 up to 4-00 P.m. Applications should be addressed to the Chairman, Baranagar Municipality, 87, Deshbandhu Road (E), Kolkata-700035,W.B. Candidates should visit the Website of Baranagar Municipality i.e. www.baranagarmunicipality.org for future guidance, schedule of selection Test/Interview etc. 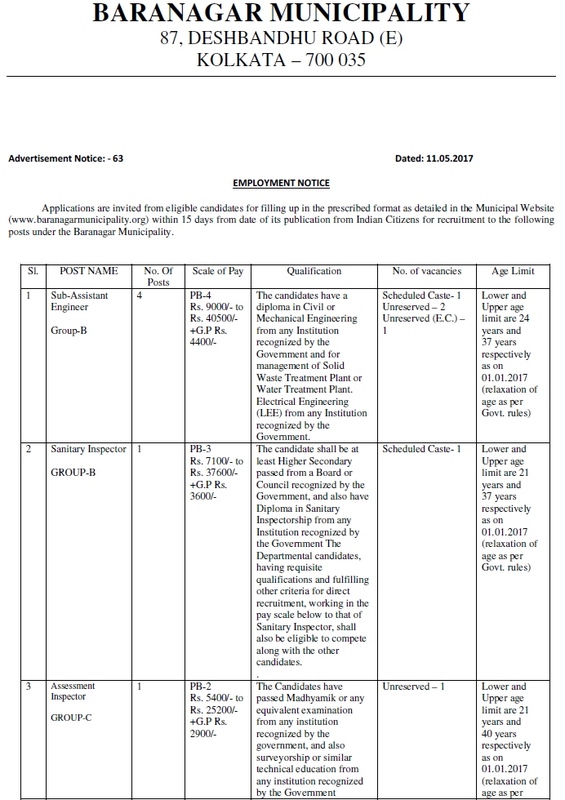 For all details, you should check out the Baranagar Municipality Job notification from below.